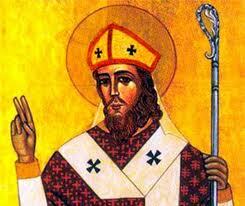 St. Hilary was born in Sardinia. He was one of the papal legates to the Robber Council of Ephesus in 449 who barely escaped alive. He was consecrated Pope on November 19, 461. 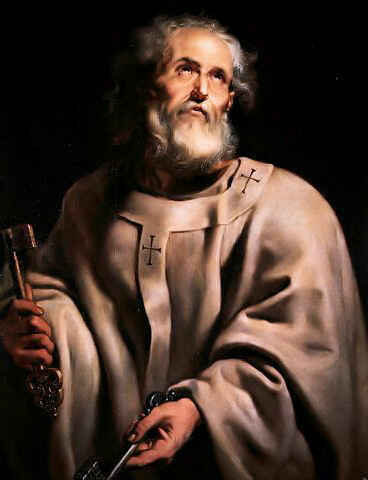 He worked to improve ecclesiastical discipline in Gaul and Spain; he ruled on some disputes between bishops and held councils in Rome in 462 and 465 to settle the matters. He rebuilt many Roman churches and built a chapel of St. John the Apostle in the baptistery of St. John Lateran in thanksgiving for his escape from Ephesus. He worked diligently to straighten out erroneous matters within the Church. He died in Rome on February 28. What is a person’s most intimate core and sanctuary? Born in 1838, his given name was Francis after Francis of Assisi. He was a great favorite of the fellow students and professors when he attended the Jesuit college at Spoleto. Literature and theater were his interests. After being miraculously cured of two bouts of illness, he decided to leave the world and went into the Passionist Institute. This decision was prompted by Our Lady. He took the name Gabriel. He was known for his great sanctity and self-denial in his short life. He died of tuberculosis at age twenty-four. Though there were no miraculous events during his life, after death he was renowned for his miracles. Pope Benedict XV canonized him in 1920. Blessed are the poor in spirit; the Kingdom of heaven is theirs! The greater the amount stolen, the more serious the moral evil. True or False? Born in Thessalonica in Macedonia. He left home in 378 at the age of twenty-two to become a monk of Scete in Egypt. After five years, he went to Palestine and visited the holy places of Jerusalem. He passed five more years in a cave on the Jordan. He was miraculously cured of disease. He was ordained a priest by the Bishop of Jerusalem against his will. He was given the job of the keeping of the Holy Cross. He was made Bishop of Gaza in 396 by the Archbishop of Caesarea who used a ruse of saying he wished to consult him. He overthrew the idol Marna and its temple. His faithful disciple and companion, Mark, wrote of his life. It is an important source of information about paganism in the Christian East. He died February 26, 420. Praying, fasting and giving alms to the poor are not always morally good. True or False? 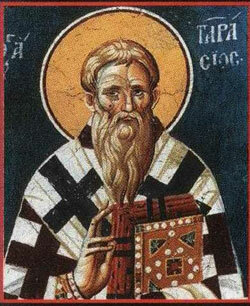 St. Tarasius, born in the Byzantine Empire, was raised to the highest honors as Consul. Later, he became first secretary to the Emperor Constantine (who was only 9 years old) and the Emperor’s mother, Irene. He was elected Patriarch of Constantinople. He consented to accept the position on the condition that a General Council be summoned to resolve the disputes concerning the veneration of sacred images. Constantinople had been separated from the Holy See because of the war between the Emperors. The Council met in the Church of the Holy Apostles in Constantinople in 706 and again the following year at Nice. Its decrees were approved by the pope. By Tarasius’ persistent refusal to sanction the divorce from his lawful wife, he incurred the enmity of the Emperor. Constantine’s death was occasioned by his own mother. Tarasius beheld the downfall of Irene and the usurpation of Nicephorus. His whole life was one of penance and prayer and hard labor. He visited the poor, the indigent and all the hospitals in Constantinople distributing alms. He died in 806. Throw your cares on the Lord, and he will support you. The end justifies the means? True or False? Matthias was a disciple of Jesus and was chosen to replace the traitor, Judas. It is said that he preached the Gospel in Ethiopia and was martyred there. No letters of his have been found. But, a third century Egyptian theologian, St. Clement of Alexandria, quotes a single sentence attributed to Matthias: “We must combat our flesh set no value on it, and concede to it nothing that can flatter it.” This is the basis for invoking him against alcoholism. The precepts of the Lord give joy to the heart. Sin can weaken or destroy our life as God’s children. True or False? 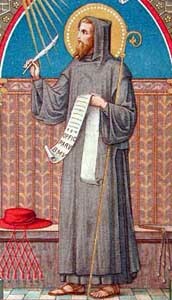 St. Polycarp embraced Christianity at a very early age. He became a disciple of St. John the Evangelist. 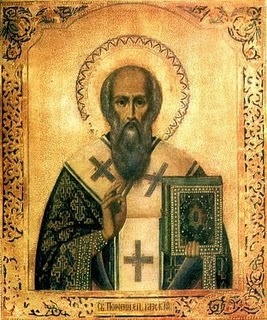 St. John made Polycarp Bishop of Smyrna, probably before his exile to Patmos. Among his disciples were St. Irenaeus and the writer, Papias. St. Polycarp went to Rome about the year 158 to consult the Pope about the date of Easter celebration. East and West had different dates. It was agreed that both should follow their own customs. Polycarp refused to deny Christ when Emporers Lucius Verus and Marcus Aurelius apprehended him. He was condemned to be burned. The flames did not touch him, but burned in an arch over his head. Then he was pierced with a sword and the blood which gushed from his wound put out the fire. His body was burned but his bones were collected by the Christians and preserved in the Church of San Ambrogio in Massima, Rome. He died around the year 166. Any sin can be forgiven through the Church. True or False? St. Gregory, the Great, states that Peter was Bishop of Antioch for seven years. Based on the unanimous consent of Christian antiquity, it is a fact that Peter was in Rome and founded the Church there. Since Peter was performing his apostolic duties, he was often absent from Rome. This feast was formerly celebrated on two different days: January 18 in honor of his Pontificate at Rome, and on February 22 in honor of his pontificate at Antioch. What prayer does one pray during confession in order to express true sorrow for sin and a desire for God’s forgiveness? He was orphaned at a young age and raised by a brother. He tended the swine in his youth. Later, a priest brother sent him to Faenza and then to Parma to be educated. Peter became a professor. He joined the Benedictines at Fonte Aveliana where he lived as a hermit. He devoted himself to the study of the scriptures. He founded five more hermitages. He became famous for his denunciation of the practice of purchasing church positions. He was named cardinal-bishop of Ostia but attempted to resign. Pope Nicholas II refused his resignation, but Pope Alexander finally permitted him to do so. He worked unceasingly for ecclesiastical reform. He engaged in several papal diplomatic missions to France and Germany. He died in 1072. He was never formally canonized but Pope Leo XII declared him a Doctor of the Church and named February 21 as his feast day. Blessed the man who greatly delights in the Lord’s commands. Where is the Eucharist reserved for adoration and distribution to the sick? He was born at Orleans, France. Around the year 714 he became a Benedictine monk at Jumieges. He was elected Bishop of Orleans around 718 over his vehement objections. He was exiled to Cologne by Charles Martel, mayor of the palace, because Eucherius opposed the use of Church funds to finance Charles’ war expenses. Because of his popularity in Cologne, Charles put him under virtual arrest at Liege. Eventually, he was permitted to retire to Saint-Trond Monastery, where he spent the rest of his life. He died February 20. What gesture made by the bishop during the sacrament of confirmation symbolizes the transmitting of the Holy Spirit? Conrad was born into a noble family in Piacenza. A fire got out of control one day when he was hunting in the woods, burning down a neighboring cornfield. To pay for the damages, he had to sell all of his possessions. He decided to devote himself to the religious life. What was left of his wealth, he gave to the poor and became a hermit. 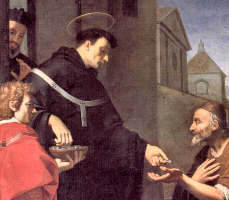 As a Franciscan tertiary, he lived a life of great austerity. His wife became a Poor Clare nun. To avoid the crowds attracted to his holiness, he lived the next thirty years in St. Martin’s Hospital and a hermitage. He spent the last years in the grotto of Pizzone outside Nono. He was buried there. Many miracles were accredited to his intercession. Who shall live on your holy mountain, O Lord? What is the feast which celebrates Mary being taken up to heaven?